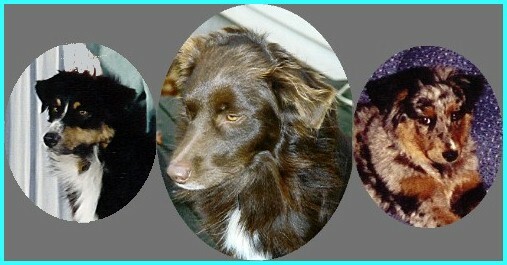 "Chelsea" (Jan 1990 - Jul 1990) She was our first Australian Shepherd. Although she was only with us a few months she has a large place in our hearts. She was my mother's shadow and had a beautiful temperament. "Vick" Delano's Coppertone Torvick ( July 1991 - Feb 1994) He came to us at the age of two, but it was as if he had lived with us since he was a pup. He heeled like a dream and slept by my side every night. "True" Manape Tributes True Horizons (Dec 1995 - Sep 1997) He was a dog who would be forever young at heart. Always clowning around, we had just begun to work as a team when we were forced to go our separate ways. He showed me that there is something special in every dog. True had a hard time getting close to me because I was still looking for what I had with Vick, but he made every effort and finally won. "Cookie" CH Charbo's Fortune Cookie (Dec 1996 - Nov 1998) She was a wonderful dog with people and loved attention. Cookie finished easily and was halfway to her Canadian CH. She was an excellent mother and gave everything she had to her 5 surviving pups. site is owned by Tribute Kennels.